- How precious is this! 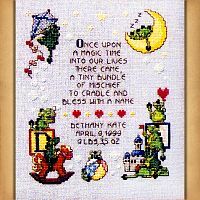 Text reads: "Once upon a magic time, into our lives there came, a tiny bundle of mischief to cradle and bless with a name." Pattern can be personalized with baby's name, birthdate, and weight. This pattern measures 90 stitches wide by 120 stitches high. 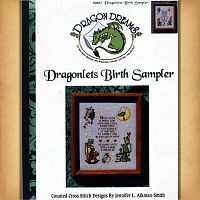 This is a pattern for counted cross stitch. It is not a complete kit. You must provide your own fabric and floss. 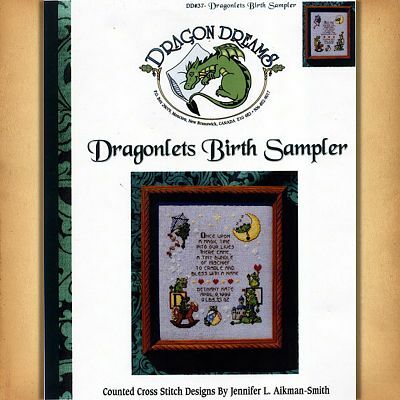 Do you have any other questions about our Dragonlet's Birth Sampler?